A loan of $5,000 helped acquire the reserved capital to maintain payroll for commercial projects and add two skilled carpenters to our team. My name is Scott Thomas-Tunstalle and I grew in the Hill District. It was a close knit community that was family oriented where business owners supported each other and engaged well with the residents. My motivation to become a successful business owner is connected to three major aspects of my life; community, family, and personal freedom. For many years, I watched as a laborer for the Local Union, the inequality of the overall development in the residential and commercial sectors in my neighborhood as well as as other neighborhoods with the same or similar demographics. The inequality I speak of comes in many forms such as high prices, bad workmanship, lack of quality training, unprofessional lines of communication, and unethical approaches to getting the jobs completed. When it comes to my family, I have seen 6 homeowners lose their home due to unaffordable construction related expenses. There were houses that my elders worked their whole life to pay off that should have been passed down to their children to strengthen the community. Yet, a leaking roof, bad wiring, furnace troubles, busted pipes, or combination of other minor problems have resulted in my family now owning only 3 houses in the Hill District. So, by freeing myself from the restraints of another entity, I have been able to bring reasonable prices, quality workmanship, develop a summer training program, speak directly to home and business owners, and create an ethical work environment. Being able to accomplish this has ensured that my family and families similar to mine can keep their homes and build upon them. 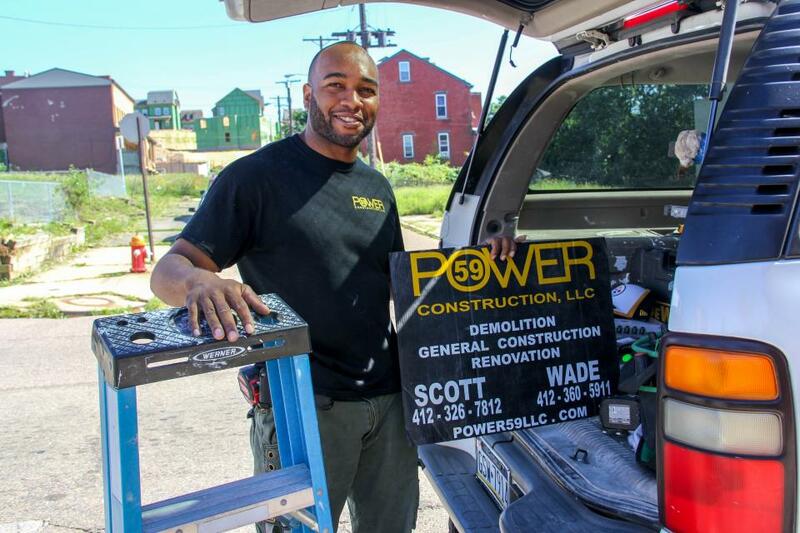 Power 59 Construction LLC, offers renovation and repair services for residential and commercial properties in the Pittsburgh region. The business model is to offer a low-cost renovation and repair service, while providing quality and reliable work to all clients. The business was launched as a limited liability company in 2011. We decided to start this business in order to have an avenue to make a change in my neighborhood. Our biggest challenge is having the reserved capital to maintain payroll for commercial projects. Our customer base consists of mainly realtors, home owners, business owners, and construction companies (hired as construction managers). The goals we have in place for our future in the construction business are to have continuous growth while maintaining quality work. We are most proud of the relationships built through our ethical standard of business practices. The purpose of this loan is to help sustain and expand our business. We are looking to add two skilled carpenters to our team, compensating them with pay at $700 per week. This will assist us with driving an additional $8000 in revenue and $2400 in profit per month. This loan will help Power 59 Construction maintain payroll and have the reserved capital to bid on more profitable jobs and projects. Also, the loan will greatly impact my life and my family by farther separating business reserved capital and the money it takes to run a family by filling in the funding gap in prevention of stretching our budget too thin. Why are you endorsing Scott? Scott is a well respected individual in the community of the Hill District. He has an engaging personality and looks to employ residents of the community to work with him. His clients speak highly of the quality of his work and open communication. As a result, Scott continues to gain additional business from referrals. We are endorsing him for a Kiva Zip loan to help expand his business.